HomeAn extra half-hour of weekday morning news is coming for KHBS and KHOG… but on their CW subchannel. An extra half-hour of weekday morning news is coming for KHBS and KHOG… but on their CW subchannel. There will finally be another option for local morning news after 7:00am in Northwest Arkansas. But it will be on a digital subchannel on one of its stations. If you haven’t seen the logos by now, then guess who? 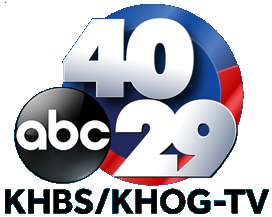 Starting Tuesday September 6th, KHBS 40/KHOG 29 is adding another half-hour to its weekday morning newscast. Titled 40/29 News Sunrise on Arkansas CW, the broadcast will air on its CW subchannel which is KHBS 40.2 and KHOG 29.2 on weekday mornings from 7:00-7:30am and its like that because of The CW Plus programming that will take over afterwards starting at 7:30am. The newscast will be anchored by Daniel Armbruster and Yuna Lee with 40/29 Get Ready Traffic from Allison Wise and 40/29 Get Ready Weather from meteorologist Laura Huckabee. It will only be a half-hour newscast, unlike KFTA 24 (FOX)’s hour-long morning newscast at 7:00am which is produced by their sister station KNWA 51 (NBC). So yet another option has come to Northwest Arkansas after 7:00am. It may be just a half-hour, but its a great alternative indeed. ← The Ark-La-Tex will soon have two 4:00 p.m. newscasts. KTBS on KPXJ and soon… KSLA too. Kind of a wimpy newscast if its a 30 minute morning newscast but its a start. Can fill the void for the hybrid local/national newscast the Daily Buzz which ran from 5:00am to 8:00m on Arkansas CW before it was canned.